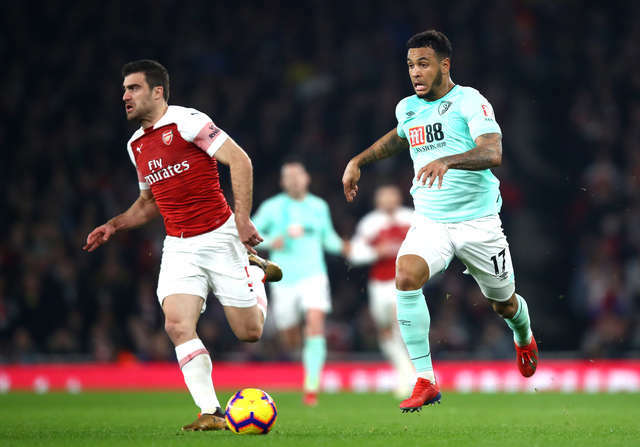 Lys Mousset’s milestone goal proved in vain as AFC Bournemouth suffered a 5-1 defeat at the hands of Champions League-chasing Arsenal tonight. Mousset netted to make it 2-1 after 30 minutes at Emirates Stadium – his goal the 1,000th conceded by the Gunners in the top flight. The Cherries had gone behind after just four minutes when Mesut Ozil drew first blood for the hosts before Henrikh Mkhitaryan doubled their lead in the 27th minute. 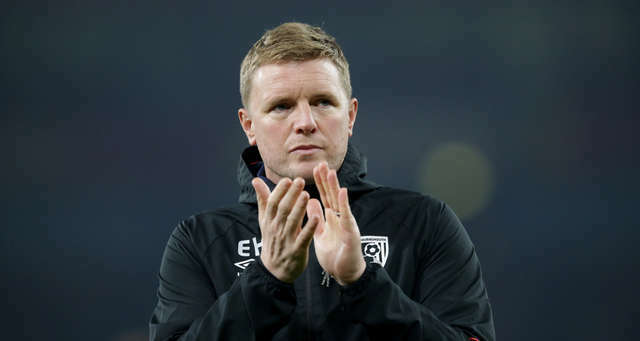 But Eddie Howe’s team quickly reduced the arrears when Dan Gosling robbed the ball off Matteo Guendouzi and teed up Mousset to make it 2-1 on the half-hour. However, second-half goals from Laurent Koscielny, Pierre-Emerick Aubameyang and Alexandre Lacazette saw the Gunners run out convincing winners. 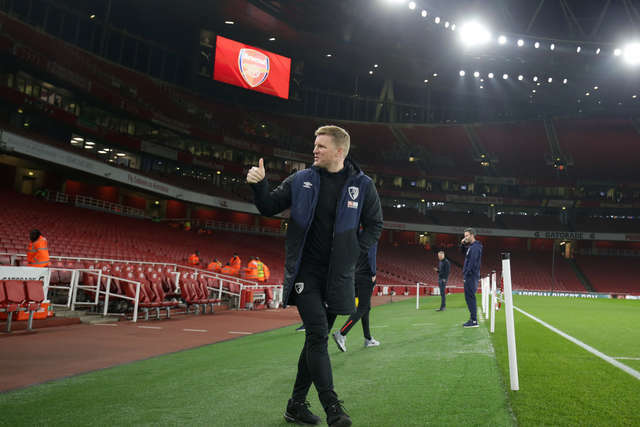 Mousset and Andrew Surman were drafted into the Cherries starting line-up as boss Howe made two changes following Saturday’s 1-1 draw with Wolves. Striker Mousset replaced Dom Solanke, who was ruled out due to a thigh injury, while Surman came in for Lerma, with the Colombian serving the first of a two-match suspension. Mousset, who has made 18 appearances from the bench this season, was handed his eighth Premier League start and first since the final day of 2017/18. 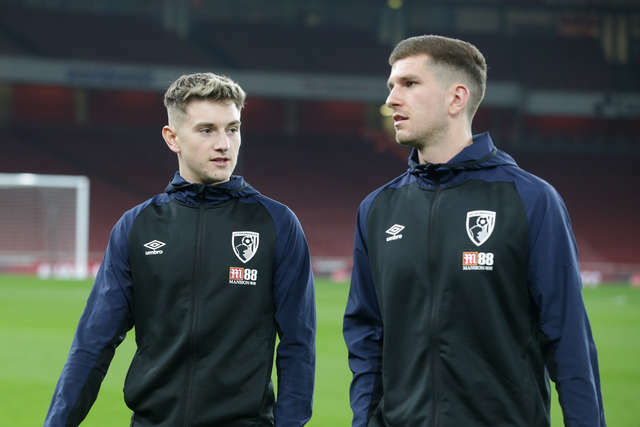 There was also a welcome return for David Brooks who was named among the Cherries substitutes having missed the past three games with an ankle injury. Arsenal made no fewer than six changes following their 2-0 victory over Southampton on Sunday, with Aubameyang starting ahead of Lacazette. The Cherries had an early scare when Artur Boruc was forced to race off his line to prevent Aubameyang from seizing on a mis-kick by Nathan Ake, the goalkeeper clearing the danger inside the opening 60 seconds. 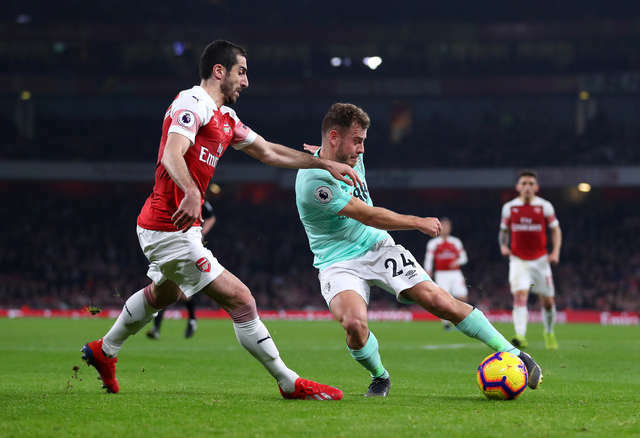 But there was no reprieve in the fourth minute when Ozil made the most of being left in acres of space and fired home the opener despite Boruc getting a hand to his shot. Ake hacked away a dangerous cross from Mkhitaryan and then nipped in front of the Arsenal man to head a through ball back to Boruc. 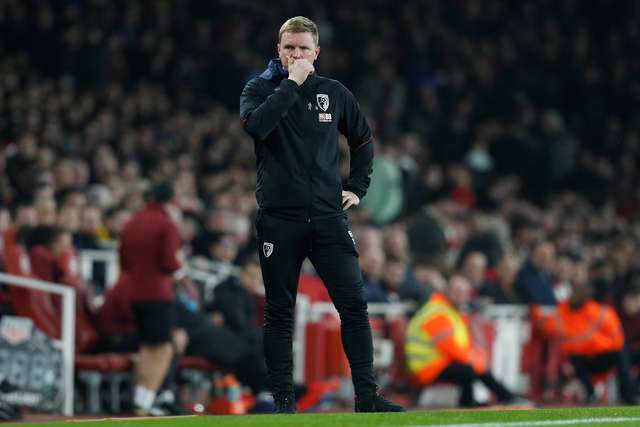 Jordon Ibe saw his shot charged down following a swift break by the Cherries before Joshua King’s header from an Adam Smith cross looped over the crossbar. Fraser raced into the 18-yard box after fastening on to a precise pass from King, the Scotsman’s placed shot superbly saved one-handed low down to his left by Leno. 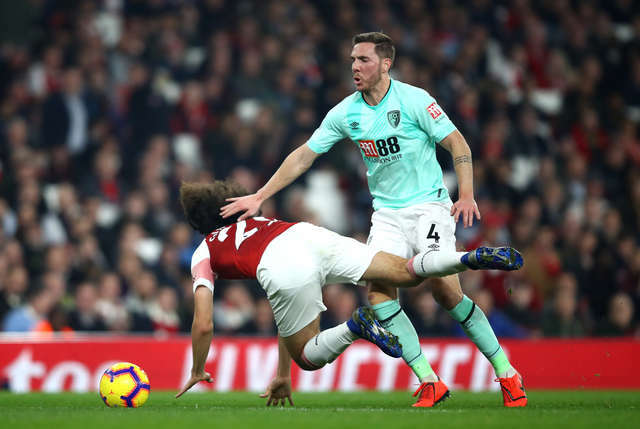 And after the loose ball had fallen invitingly at the feet of Dan Gosling, his follow-up effort was beaten away by Koscielny's diving block. 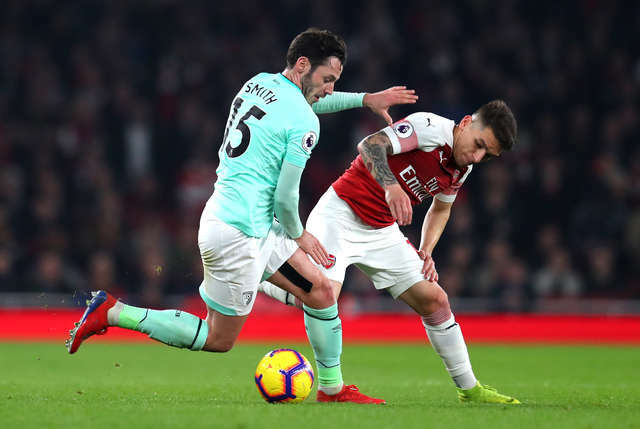 The Gunners doubled their lead after Smith had gifted possession to Mkhitaryan as he attempted a crossfield pass to Nathaniel Clyne midway through the first half. And after the Armenian international had slipped the ball into the path of Ozil, he was on hand to volley home the German playmaker’s centre. 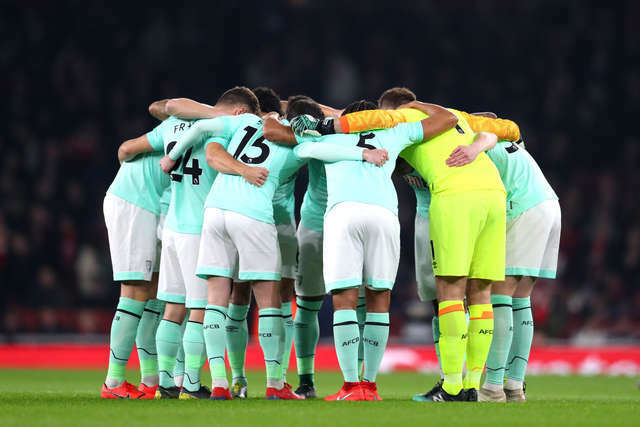 However, the Cherries halved the deficit just three minutes later when Arsenal paid a heavy price for trying to play out from the back. Gosling cleverly anticipated Leno’s ball to Guendouzi, nicking it off the toes of the France under-21 international midfielder before cutting it back to Mousset who swept home from 12 yards. 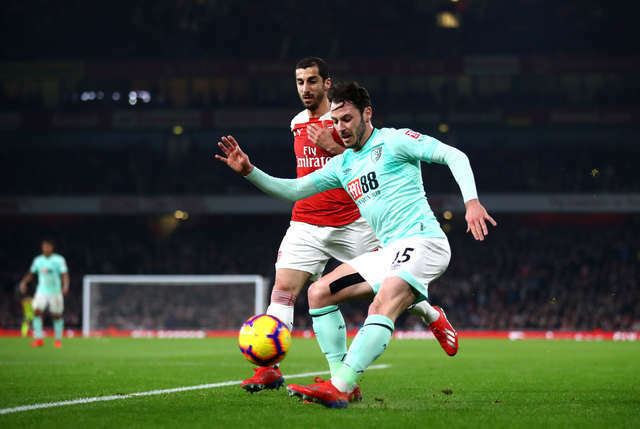 It was the first goal the Cherries had scored in open play at the Emirates Stadium – and the 1,000th conceded by the Gunners in the Premier League. A combination of Ake and Surman dived in front of Aubameyang to block his goal-bound effort before Boruc saved smartly at his near post after Guendouzi had tried his luck from a tight angle. 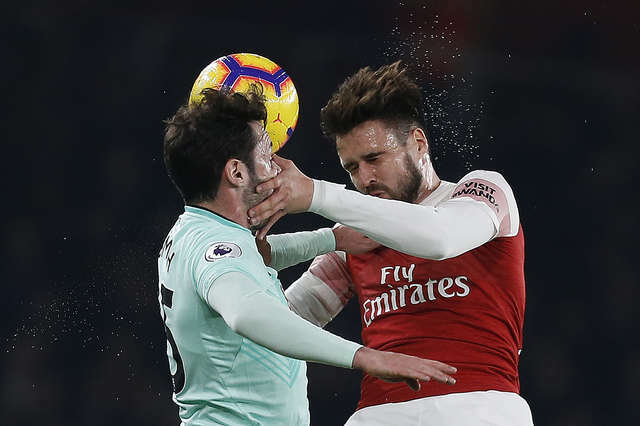 Arsenal restored their two-goal lead just two minutes after the break when Koscielny’s shot hit Chris Mepham, the upright and then Boruc before dropping over the line. Fraser strode forward and tried his luck from range with Leno falling to his left to keep out the winger’s low drive. Ozil was denied his second and Arsenal’s fourth after he had met Aubameyang’s cross at the near post, only to see his effort hit the base of the post. 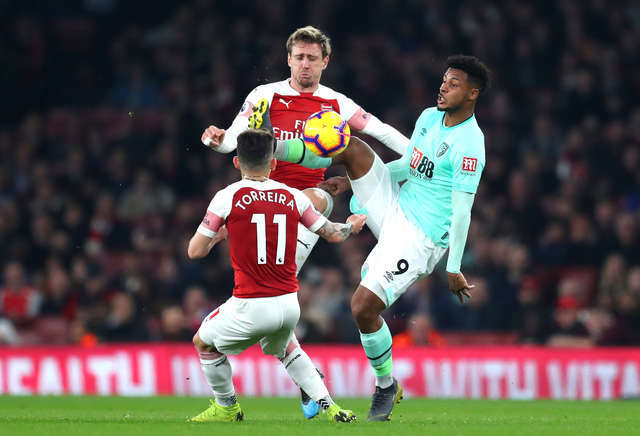 A speculative long-range strike from Gosling struck Nacho Monreal and hit the crossbar before Aubameyang added a fourth on 59 minutes. The Gunners’ leading marksman took to 17 his tally in the Premier League for the season when he latched on to Mkhitaryan’s through ball before rounding Boruc and firing into an unguarded net. 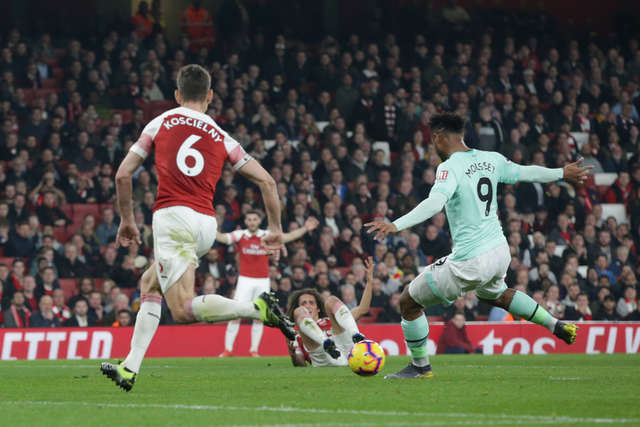 The teams traded chances when Arsenal substitute Lacazette saw his shot pushed behind by Boruc before King’s rasping drive was tipped over the crossbar by Leno at the opposite end. 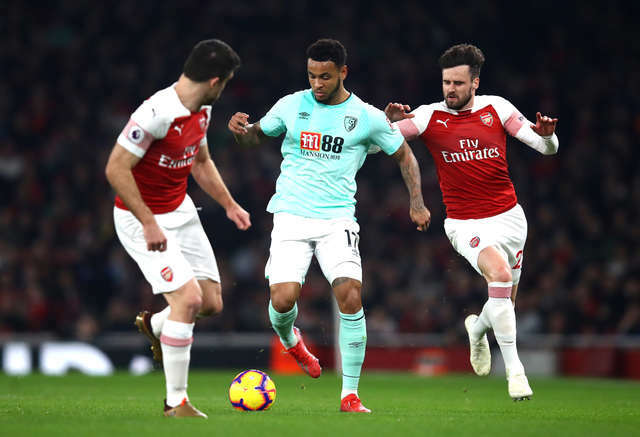 Lacazette made it 5-1 when he lifted a free-kick over the Cherries defensive wall and squeezed it inside Boruc’s right-hand post 11 minutes from time. 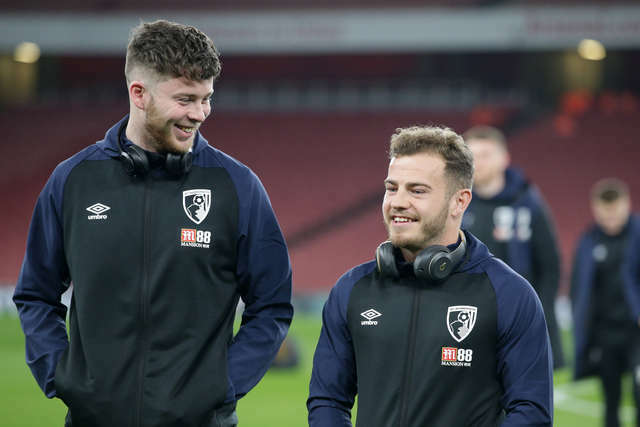 Sam Surridge came off the bench to replace Fraser in the 80th minute for his Premier League debut. Drafted in for his first Premier League start of the season, Lys Mousset gave the Cherries a glimmer of hope when he scored to make it 2-1 in the 30th minute. The young Frenchman worked hard, often ploughing a lone furrow up front, and earned his goal, the 1,000th conceded by the Gunners in the top flight. 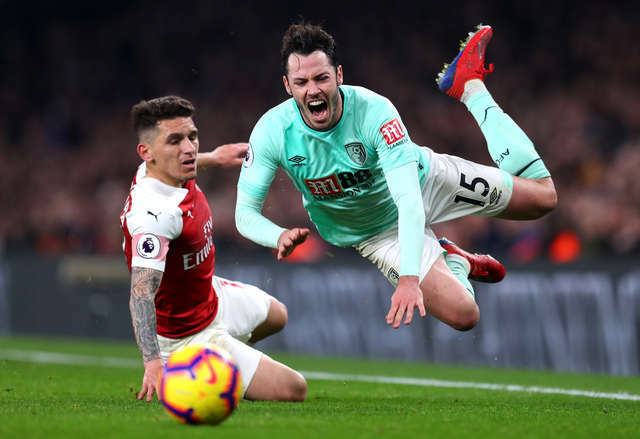 Despite the scoreline and although Arsenal were worthy winners, it could have been a slightly different story had the Cherries had some good rather than bad fortune on occasions. Artur Boruc managed to get a hand to Mesut Ozil’s opener and Adam Smith’s stray pass lacked pace in the lead up to the second. Leno then made a great save to deny Ryan Fraser before Arsenal’s third goal struck Chris Mepham, the post and then Boruc. And the crossbar came between Dan Gosling and a goal with the score at 3-1.